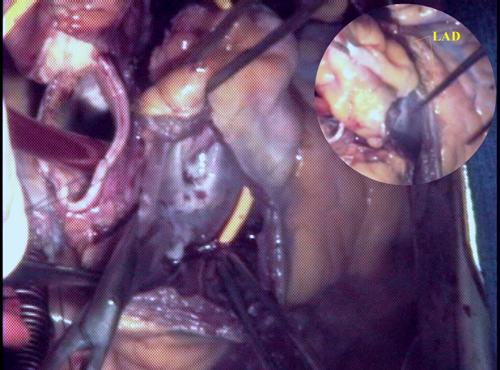 The first step in any aortic valve operation is to open the aorta and inspect the valve. Blood flow is diverted through the heart-lung machine and the heart is “turned off” during this time. 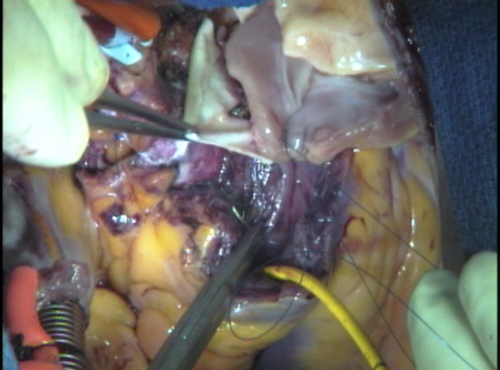 The incision is made just above where the coronary arteries are attached to the aortic root. 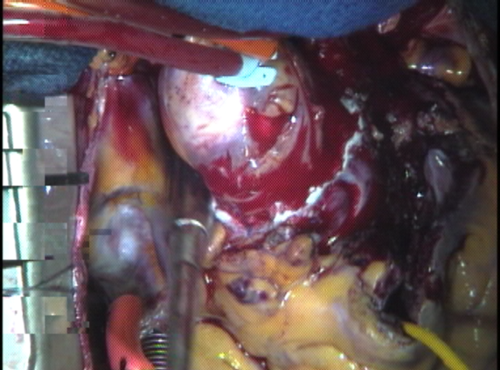 This images shows the diseased aortic valve being removed from the aortic annulus. The yellow form, seen arching along and above the rim of the aortic root is the pulmonary artery and root. The aortic valve, in this instance, is bicuspid and heavily scarred. Also visible is the scar tissue still attached to the aortic annulus. Removal of scar tissue and calcium deposits from the interior surface of the aortic root and annulus is also done at this time. The pulmonary valve must now be inspected to make sure it is suitable to use as a replacement for the aortic valve. The pulmonary artery is opened just below where it branches off. The pulmonary root is dismantled if the valve is suitable. With the pulmonary artery detached from the pulmonary root, we are free to look down the shaft of the pulmonary root and inspect the leaflets. 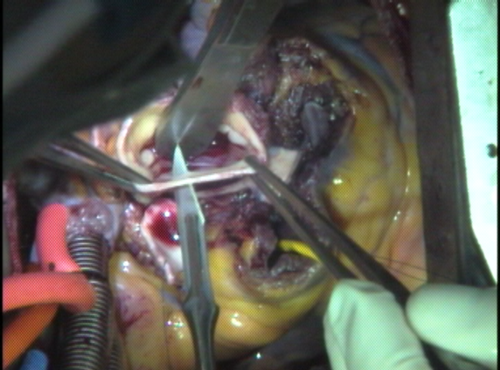 The leaflet being examined is thin and elastic, unlike the valve removed from the aortic root. One can virtually see through the leaflets of a normal pulmonary valve. About 1% of the time, the pulmonary valve is not suitable for the Ross Procedure. If it has only two leafets (bicuspid) and should not be used as an autograft. Rarely, previous surgery such as VSD repair may have adverse effects on the valve and preclude transfer to to the aortic position. Leaflets may also be abnormal with intrinsic “floppiness” we term myxomatous disease or have extensive fenestrations in the leaflets which will interfere with proper function under higher pressure. The pulmonary root is excised by cutting into the muscle of the right ventricle below the level of the valve leaflets. This leaves a narrow rim of muscle tissue around the inflow end of the pulmonary valve that is used for sewing later. The left anterior descending (LAD) branch of the left coronary artery circles the pulmonary root as it heads down toward the bottom tip (or apex) of the heart. The close proximity of the LAD makes careful and gentle excision of the pulmonary root imperative. 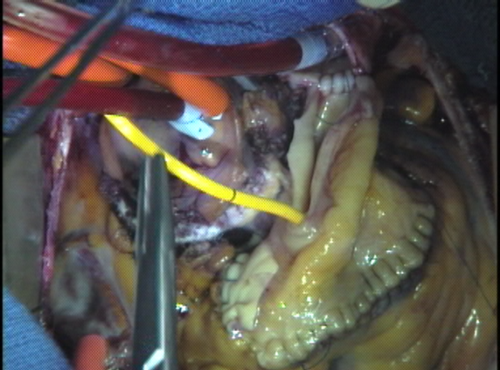 With the pulmonary root removed, both coronary arteries are exposed. 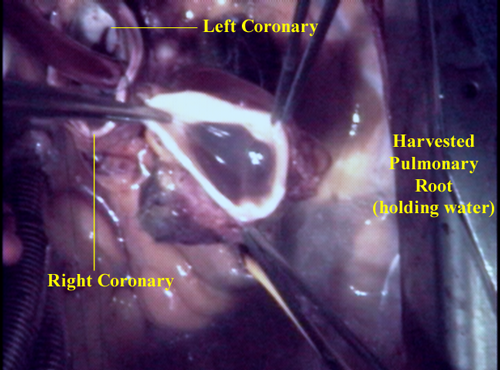 The harvested pulmonary root is placed next to the heart in the pericardium until needed. The incision initially made to inspect the aortic valve is now continued in a circular fashion to sever the aortic root from the rest of the aorta. The tissue at the base of the aortic root used to be removed but is now preserved for later inclusion around the autograft for external support. 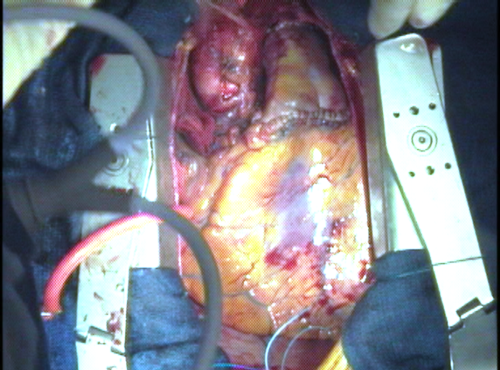 The wall of the aortic root around the opening leading to each coronary artery is cut out to sew in as a “button” later. These coronary artery “buttons” will be reattached after the new aortic root is constructed using the autograft – the patient’s pulmonary root complete with its valve. The wall of the aortic root around the left coronary artery (seen oozing blood down the inside wall of the aortic root) is cut out so that it may be integrated into the new aortic root that is fabricated from the pulmonary root. 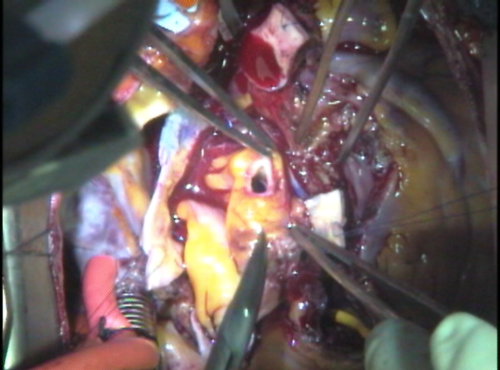 Also of note on the right side of this image is the wide opening left in the right ventricle after removing the autograft. This opening can be measured with cylindrical sizers to determine the optimal size of homograft to thaw. The pulmonary root (which still contains the pulmonary valve at the base) is placed in the opening where the native aortic valve was removed at the outlet of the left ventricle. Because both the pulmonary and the aortic valve are attached to the wall in a coronal (crown-shaped) configuration, the pulmonary root must be oriented in such a way as to allow the coronary artery “buttons” to fit properly in the sinuses between commissures. A strip of Teflon felt is incorporated into this crucial suture line to support the tissues, avoid bleeding, and provide fixation of the annulus diameter to avoid stretching in the future that might distort the base of the valve and cause it to leak. Between 35 and 50 “bites” are taken (1-1.5 mm apart) to attach the autograft securely. After all the stitches are placed, they are carefully tightened with little hooks and tied securely. The new valve can be filled with saline solution to test gross competence and inspected to make sure all the sutures are tight. A hole is then punched in the back wall of the pulmonary root in what has now become the left coronary sinus of the autograft. The coronary arteries are sewn in place with very delicate stitches in this fragile tissue. 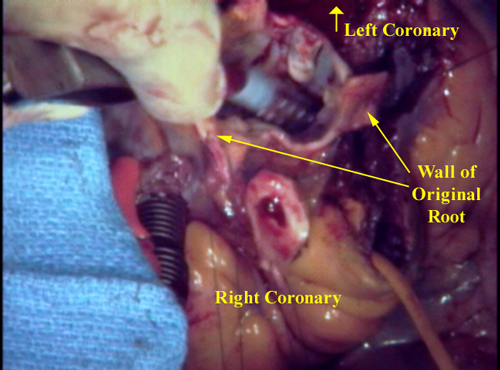 The left main coronary is attached first since it is in the back. The wall of the aortic root around the right coronary artery is now cut out. 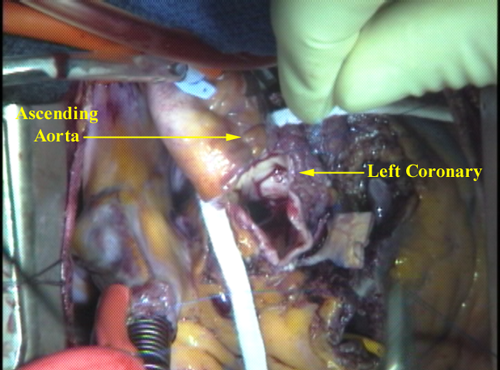 The left coronary artery “button” is finished. The top end of the pulmonary root is now sewn to the rest of the aorta. 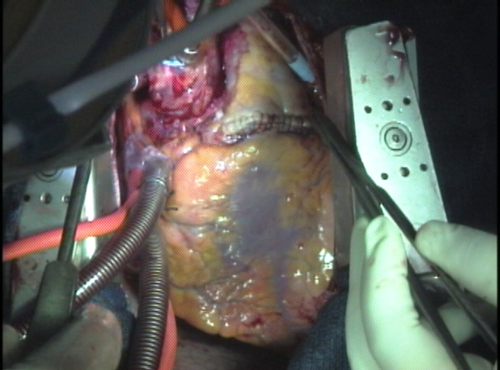 In certain patients, the ascending aorta is too big and must be cut down to size by removing a portion from the wall. If the aorta is more than 5.0 cm in diameter or too thin it should be replaced with a vascular tube graft. The target diameter of the aorta should be 3.5 cm or less. What was once the patient’s pulmonary root is now a functional aortic root. The root is pressurized by giving cardioplegia solution (cold potassium-rich oxygenated blood) into the ascending aorta just above the autograft attachment point. The root fills up as the valve closes and the cold blood courses down into the coronary arteries through the reimplanted “buttons” of each. 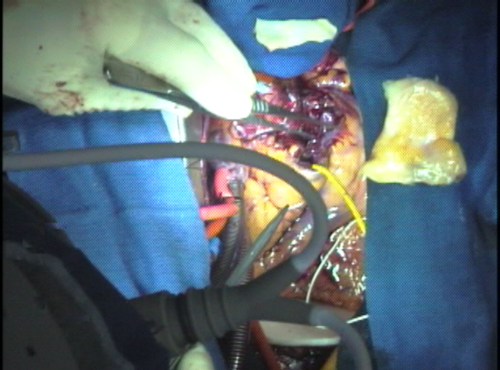 This also gives an initial check on the security of the stitches around the coronaries. TEE can be used to check for valve competence at this point. Attention now shifts to the right side of the heart. A cryo-preserved pulmonary homograft is implanted in the pulmonary position vacated by the native pulmonary which is now functioning as the aortic root. 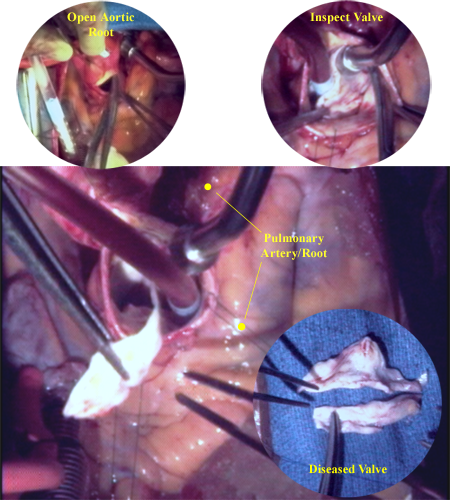 The size of the pulmonary root was noted earlier so an appropriate frozen human donor pulmonary artery (complete with its valve) could be thawed out. Installing the homograft is easier than the autograft because the pressures will be lower here, but must be done with great respect for the proximity of the left coronary artery system. 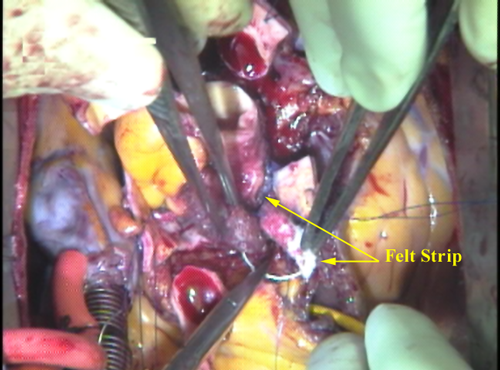 A strip of excess homograft wall is used as a reinforcement of the ventricular septal muscle from which the autograft was cut. This area is inaccessible later. 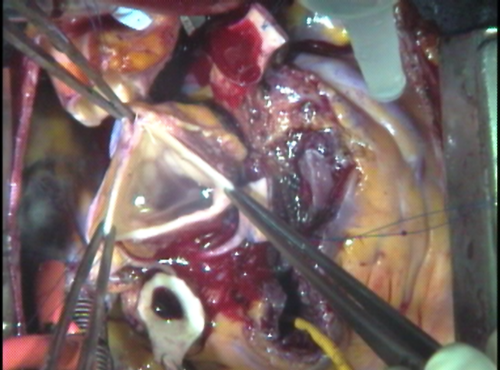 The final step of the reconstruction is to attach the end of the homograft to the native main pulmonary artery just before it branches to go to the right and left lungs. The heart is gently rewarmed during this time with warm blood administered retrograde (backwards) through the veins of the heart. When the sewing is complete, air is vented from the heart and the clamp on the aorta is removed restoring normal coronary blood flow. The heart lung machine continues to support the work of the heart until it has had sufficient time to completely rewarm and beat normally. This usually takes at least 15-20 minutes. During this time, the suture lines are inspected for any leaks that might need touching up. This image shows the finished product. The heart is beating, and both valves are working fine. If need be, the new aortic root can be wrapped in surgicel (absorbable cellulose) to discourage bleeding. 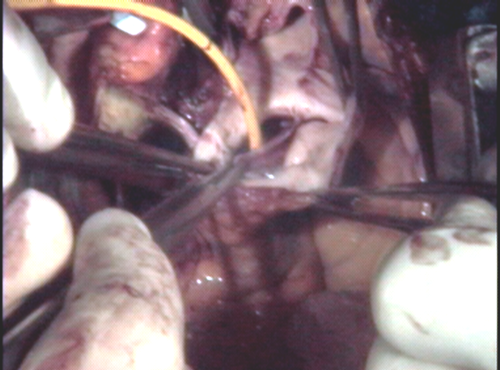 The suture line connecting the pulmonary homograft to the right ventricle is clearly visible. Just above this suture line is a gentle billowing of the pulmonary root which represents the sinus portion of one of the leaflets, expanding as blood fills the homograft with each beat.